Today Anthony Watts (archived here) copied and pasted the press release from a study I wrote about last week. It was about the paper by Leopoldo Pena and Steven Goldstein on what caused the ice ages to change around a million years ago. The paper was presenting an explanation of the 100,000 year glacial cycle. You can read about it here or at ScienceDaily.com. Because the astronomical drivers of climate variability remained the same (3), there must have been primary changes in the ocean-atmosphere-continental ice system....A point of consensus is that decreased pCO2 was important for enhancing cooling and facilitating ice-sheet growth, and modeling studies conclude that pCO2 reduction during glacial periods may be the result of decreased ocean ventilation, increased carbonate alkalinity, terrestrial carbon storage and increased marine productivity, and that the deep ocean’s storage capacity would be enhanced by a weaker THC. Figure 1. Meridional hydrographic profile in the present-day South Atlantic showing the different water masses based on the salinity distribution (World Ocean Atlas). ODP Sites 1088 and 1090 are located at the upper and lower boundaries of the southward flowing NADW wedge, and is partly mixed with northward flowing CDW and AAIW. White isolines correspond to the modern South Atlantic seawater εNd (29), and show that NADW has more negative εNd (-10 to -10.5), whereas present day CDW and AAIW have higher εNd (-8.5 to -9), which reflects the mixing of Atlantic and Pacific source waters (23). Source: Pena and Goldstein (2014), Science. We conclude that the MPT [mid-Pleistocene transition] was marked by a drastic change in the deep-ocean thermohaline circulation during glacials, which shifted from an active pre-MPT glacial-THC [thermohaline circulation] mode to a reduced post-MPT glacial-THC mode. In contrast, the vigor of the THC pre- and post-MPT has remained similar during interglacials. 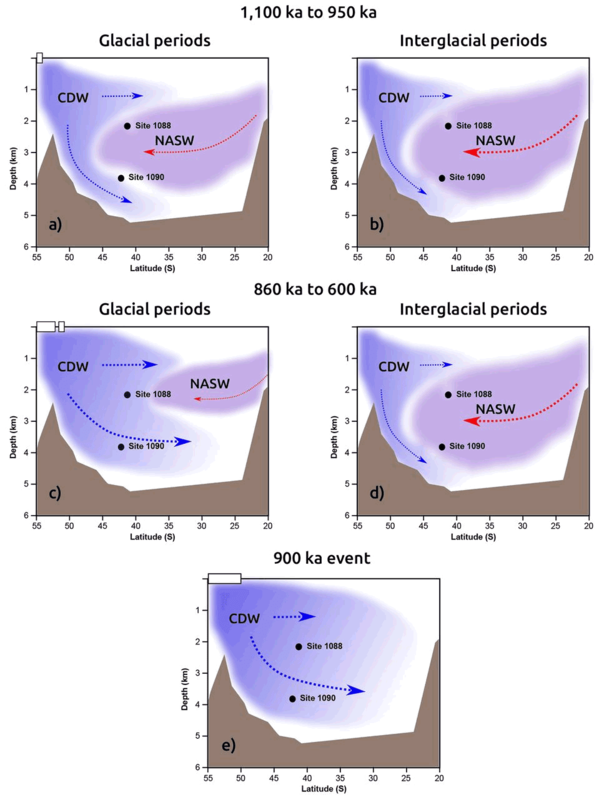 A variety of observations document a series of events that fed back upon each other during the first ‘100-kyr glacial cycle’ between MIS [Marine Isotope Stages] 25-21 (~950-850 ka) and led to permanent increases in the length of glacial-interglacial cycles and the intensity of glacials. The North Atlantic ice sheets reached a milestone in size and/or stability that resulted in significant reduction of THC vigor during MIS 24 (Fig. 2). The weak THC in turn facilitated atmospheric CO2 drawdown (16, Fig. 3) by reducing exchange between Antarctic surface- and deep-waters, which in turn resulted in further cooling. The lower temperatures facilitated significant ice sheet expansion in Antarctica (8) as well as the North Atlantic region, since the weak export of North Atlantic source waters, typical of post-MPT glacials, continued through the critical ‘transglacial’ MIS 23. These impacts were amplified by anomalously low Southern Hemisphere summer insolation during MIS 23, resulting in suppressed interglacial melting of Antarctic continental ice, likely amplified by sustained sea-ice cover around the Southern Ocean (14). The cold glacial conditions and weak THC continued through MIS 22. Together, these effects facilitated major ice-sheet expansion through the MIS 24-22 interval, and generated conditions for crossing the threshold to further 100-kyr glacial-interglacial cycles and colder glacials. Figure 4. Schematic illustration of the changes in South Atlantic THC across the MPT. The pre-MPT time period of MIS 31-25 (~1100-950 ka) is characterized by significant export of NASW to the South Atlantic during both (a) glacials and (b) interglacials. εNd-values indicate little glacial-interglacial variability at mid-depth (Site 1088), and significant NADW contributions during glacials. In the deep ocean (Site 1090), the difference between glacials and interglacials is larger, but pre-MPT glacials show substantially more NASW than post-MPT glacials. The post-MPT time period since of MIS 21-15 (~860-600 ka) is characterized by (c) strong THC during interglacials, like the pre-MPT period, but (d) weak THC during glacials. The (e) MIS 24-22 interval, centered at ~900 ka, shows an unprecedented weakening of NADW, while post-MPT glacials. MIS 23 is unique as an interglacial with THC like post-MPT glacial periods. Source: Pena and Goldstein (2014), Science. What is this fixation with CO2??? All hat needs to be said is that slowing or stopping currents transporting warm equatorial water towards the poles to keep the ice caps at bay, allowed them to expand even further. They had to throw CO2 into the paper to get it published I guess, eh? I doubt that CO2 had much to do with stopping or starting glaciation episodes, although their point about the thermohaline currents slowing down is a rather obvious one. Of course these would slow down during a glaciation period. Everything slowed down except the rush to the nearest trading post to get a thicker parka. Just amazing how that tiny little gas up there in the sky controls nearly everything. If glacial periods are so predictable due to orbital changes, when is the next one due? And what became of the theory that only Earth core temp changes due to playing out of nuclear fuel were great enough to explain massive temp drops. And how does the Earth ever manage to get out of a glacial period, according to these guys? Pretty superficial article. methinks that with all that CO2 being dissolved in the ocean, there would not have been much atmospheric CO2 to support photosynthesis. How was the plant life in the tropics during this CO2 starvation? Slowing currents increased CO2 transfer??? That is a good question. If the control of these periods is by the three Milankovitch cycles, at the current time, only one of these cycles is standing in the gap between this interglacial and the next glaciation period; and that one, obliquity, will be going into the bottom end of its 41,000 year cycle in about 850 years. Neither of us will be around to see it, but then, it is only theory we are talking about. It could come tomorrow, or, 5,000 years from now. Regardless, glaciation will come and will last for 85,000 to 90,000 years as it has done so for 10 times already in the last million years. If ,as suggested the climate cooled because all the CO2 was taken out of circulation, how the hell did it warm again with all the vegetation virtually dead? Surely the ice age must have been self pepetuating? Oh my, that had to get CO2 into it somewhere, even if their research had nothing to do with CO2. I don’t give a flying fox what scientists “believe”. What is relevant is what their research shows, not personal “beliefs”. So what their research actually showed is that ocean currents are a determinant factor in climate change. On the contrary their research does NOT show that CO2 amplified that or played any role whatsoever. Following my earlier comment i suppose subsequent warming could have been triggered by errupting volcanoes. Does this sound feasible? The assumption that the surface is generally in equilibrium without man made ghg’s is a poor assumption. What utter nonsense! What part of CO2 ALWAYS lags temperature in ice cores don’t they get? On top of that, ocean currents don’t determine the amount of CO2 in the oceans–the water/air temperatures do. On top of that, what possible physical CO2 process would make subsequent ice ages less frequent? Now that continental drift is accepted (took a while for the ‘experts’ to change their consensus on that one), what effect did this have on ocean currents 1,000,000 years ago? Was this factored into their analysis? It is a bit surprising that CO2 which has explained so little of current temperatures is still used to explain just about everything in the past. When will they ever learn? Are climate scientist deficient in imagination? Even with their bow to CO2 they are still admitting that it was a natural process, which is, in itself, quite an amazing admission. Of course their cause and effect is still questionable relative to the more simple warm water conveyor north being disturbed. Londo says: June 30, 2014 at 1:54 pm It is a bit surprising that CO2 which has explained so little of current temperatures is still used to explain just about everything in the past. When will they ever learn? Are climate scientist deficient in imagination? I believe I once heard someone say: when all you’ve got is a hammer, everything starts to look like a nail. I gave up reading the BS when I saw that CO2 was responsible for the cooling. It is polluted by CO2 but nonetheless interesting e.g. in background information about glacial-interglacial cycling. The important message is that in the long term glaciation is deepening. From interglacials at 41k year intervals, to 100 k year intervals, to – if the trend continues – a future of uninterrupted glaciation with no interglacials – for a few tens of millions of years. Rather than the neo concentrations being controlled by the changing of the currents, it could also be explained by changing rainfall on the continents, varying the run off into the oceans. This quote gives me pause: “The ice sheets must have reached a critical state that switched the ocean circulation system into a weaker mode,” said Goldstein. They make a lot of claims from a rather weakly related proxy — they can be pretty sure about neodymium ratios but there may be more reasons than “strength of ocean currents” to explain their rise and fall off the coast of South Africa. Assuming a proxy is the equivalent of just the “thing” your group is looking for is not necessarily sound science — sorta like tree rings are a thermometer. I seem to recall a WUWT commenter once saying that there is a pattern to WUWT comments. The dumb one-liners pour in first and the (somewhat) more substantive comments come only later. That was certainly the pattern in this case. The most likely candidate for the MPT trigger is Canadian regolith removal (see refs. 5 and 7 in the paper) that essentially made the glaciers stick in place more. For future reference, the problem of the post-MPT deglacial trigger seems to have been solved by Ayako Abe-Ouchi and colleagues. Essentially, growing ice sheets in 100 ky cycles undergo a number of warming events that don't make them go away, until finally one does. The mystery was that the final warming isn't meaningfully stronger than the previous ones. The answer is that the NH ice sheets need to be at maximum southern extent (with enough of a summer insolation push) so that a runaway ice-elevation feedback can be triggered. In the end, the ice sheets' own size does them in. Sou, the bit that I thought was most amazing of all the replies you quoted was where JimS said: "and that one, obliquity, will be going into the bottom end of its 41,000 year cycle in about 850 years. Neither of us will be around to see it, but then, it is only theory we are talking about. It could come tomorrow, or, 5,000 years from now. " Astronomers could, if pressed, calculate the next point of maximum obliquity (in about 11,800 years) to an accuracy of about 10 days (0.0003%), were it not for the fact that unpredictable events (major earthquakes, large impacts etc) alter the periodic components unpredictably. These could alter the exact timing of maximum inclination by an order of years-to-decades depending on size and timing, but nothing like the 5000 years JimS suggests. But more remarkable is JimS claiming earth is "going into the bottom end of its cycle" in 850 years. Assuming that means passing its mean point on a descending path - that happened in 1550. Conclusion: JimS is posting from the the early 8th century. I suppose I shouldn't be surprised that Willard Anthony is attracting posters from the Dark Ages, but I didn't know vellum was html compliant.